Most of us like to unwind after a stressful week, carving out some family time, heading out to dinner at a restaurant or taking in a movie at the local multiplex. And, if you're like most of us, you're spending more money than you think on entertainment. But you don't have to drop a wad of cash to enjoy yourself. We've already shown you how to live beneath your means -- and have more money in your pocket -- when it comes to saving on housing and cars. Now let us introduce you to some Americans who don't spend big bucks to have a good time. They don't get bored and they have cash left over for other expenditures. Valerie Cudnik of Chesapeake, Va., admits she went out to eat within the past month. But her youngest son was turning 18, so a celebration was in order. Still, she managed to get out of the restaurant paying just under $60 for four people, including a 20% tip. ("I waited tables years ago, so we don't cut corners there," she tells WalletPop.) But ordinarily, Cudnik avoids restaurants. In her meticulously organized Quicken file, Cudnik has documented a little more than $1,000 in restaurant spending, plus around $300 for fast food, for her family of four over the past 15 months. That averages out to $1,040 per year. By contrast, the average American family spent $3,449 on "food away from home" in 2008, according to the Bureau of Labor Statistics. That's a lot of (often unhealthy) food and overpriced drinks that add up to a pretty substantial chunk of change. Cudnik says she dodges the restaurant trap by pretty much cooking at home all the time, whether she whips up something from scratch or relies on a boxed mix to turn a few ingredients into a meal. Another sneaky, meal-related drain on your wallet? Takeout lunches. Ilene Davis of Cocoa, Fla., discovered that for herself and says she now brown-bags it all the time unless she has plans to meet a friend for lunch. Sheryl Parsons of Utah takes this campaign against the quickie, wallet-draining meal one step further: "If we take a trip, we take a cooler [of food] with us to save money," she tells WalletPop. 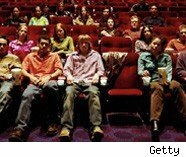 If we do the math, an average family of four spends $195 per year on movie theater tickets. But if you live in an area of the country where ticket prices have crept into the double digits (or if you like those pricey 3-D or IMAX screenings), you could be paying much more. Georgia resident Danny Kofke has also given up the multiplex in favor of $1 movie rentals, which is a smart move, says Stacy Johnson. "You should never really have to pay to see a movie at all," he says. "If you want to see movies, go to libraries and [rent] movies for free -- they're full of every single kind of entertainment there is." (Some libraries do charge a buck for movie rental; others are free. It depends on the town.) No, you won't be able to get new releases, Johnson acknowledges, but he points out that patience can save you a lot of money. Wolk-Stanley says movie nights at home have other perks, too. "My 11- and 14-year-old sons will often have friends spend the night over the weekend. Nobody cares if a movie is from the library or a video store," she says. An added benefit? She says her kids and their friends, who grew up in the microwave popcorn generation, love to watch while she pops corn on the stove for them -- further proof that sometimes, the best entertainment doesn't cost anything at all.